Belkin Kitchen Stand: makes it easier to go through your recipes in the kitchen. It has a magnetic-tipped stylus too. Cooler Master Cube for iPad 4 & iPad mini: a collapsible universal tablet stand you can use in the kitchen and everywhere else. It has adjustable height settings. 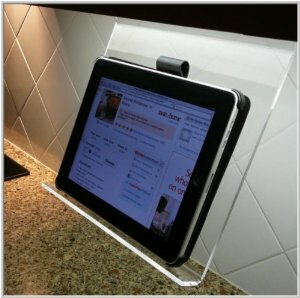 The Original Kitchen iPad Rack: this iPad rack holds your tablet in landscape or portrait mode. It is very easy to install and works with your iPad case or sleeve. 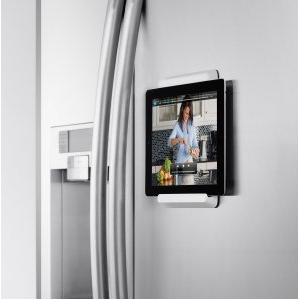 Belkin Fridge Mount for iPad: another awesome mount by Belkin. It lets you attach your tablet to your fridge. It is compatible with the iPad 2 to iPad 4. 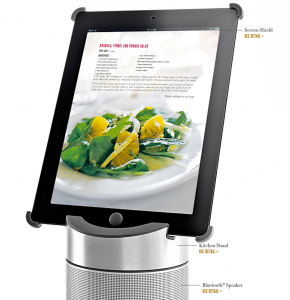 Williams-Sonoma Smart Tools for iPad: a complete set of kitchen accessories for your iPad. You get a kitchen stand, speaker, and a screen shield. Joseph Joseph CookBook Bookstand: use this to hold your recipe books or tablet. It is made of high-quality ABS plastic. There are many other stands you can use in your kitchen to hold your tablet. Whatever you do, make sure you get a splash-resistant case for your device.